MyDeathSpace.com links to people from MySpace who have passed away. 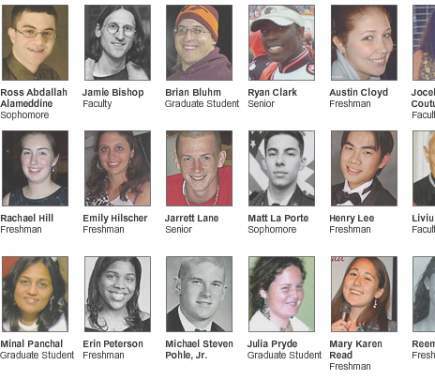 They have a special page up for the victims of the Virginia Tech Shootings. This is by far the most heartbreaking link I think I’ve ever seen. It’s one thing to read an obituary but going through the blogs of the dead and comments left by friends paints a personal picture of each victim that we never usually get to see. In Jamie Bishop’s German class, they could hear the popping sounds. What was that? Some kind of joke? Construction noises? More pops. Someone suggested that Bishop should place something in front of the classroom door, just in case. The words were no sooner uttered than the door opened and a shooter stepped in. He was holding guns in both hands. Bishop was hit first, a bullet slicing into the side of his head. All the students saw it, an unbelievable horror. The gunman had a serious but calm look on his face. Almost no expression. He stood in the front and kept firing, barely moving. People scrambled out of the line of fire. Trey Perkins knocked over a couple of desks and tried to take cover. No way I can survive this, he thought. His mind raced to his mother and what she would go through when she heard he was dead. Shouts, cries, sobs, more shots, maybe 30 in all. Someone threw up. There was blood everywhere. It took about a minute and a half, and then the gunman left the room. The photographer whose specialty was anthropomorphism. The March 1, 1937, edition of Life magazine reatured an article on Mr. Frees titled, “Speaking of Pictures…These are Harry Frees’s Lifework”. 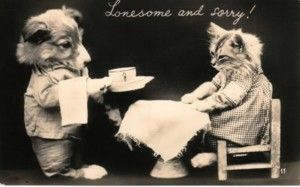 The article explains that Frees’s career as a photographer of dressed animals began at a birthday party in 1906, when a paper party hat was passed around the dinner table and landed on the pet cat’s head. Harry took a picture and a career was begun! He took others and sold them to a postcard printer, who clamored for more. Another clip of everybody’s favorite public access host, Alexyss Tylor, with her Ed Mcmahonesque sidekick, mom. This may be the first public access show in history where I’ve actually wanted to buy season one on dvd. If you liked the last clip, you’ll like this one. Somebody’s been busy posting more Alexyss Tylor shows. The NY Times has a profile on each of the victims of the Virginia Tech tragedy.